September | 2011 | ride.hike.eat. I once again signed up to ride the Corkscrew Century, which is part of the Highlander Cycle Tour. I could not resist! A few of my friends committed to riding it, so how could I not do the same. Peer pressure! :) Joel decided to ride the Mountaineer, which is the mountain bike version of the ride. After I sluggishly packed the car with my cycling gear, we were ready to leave the house around 6:00 am. 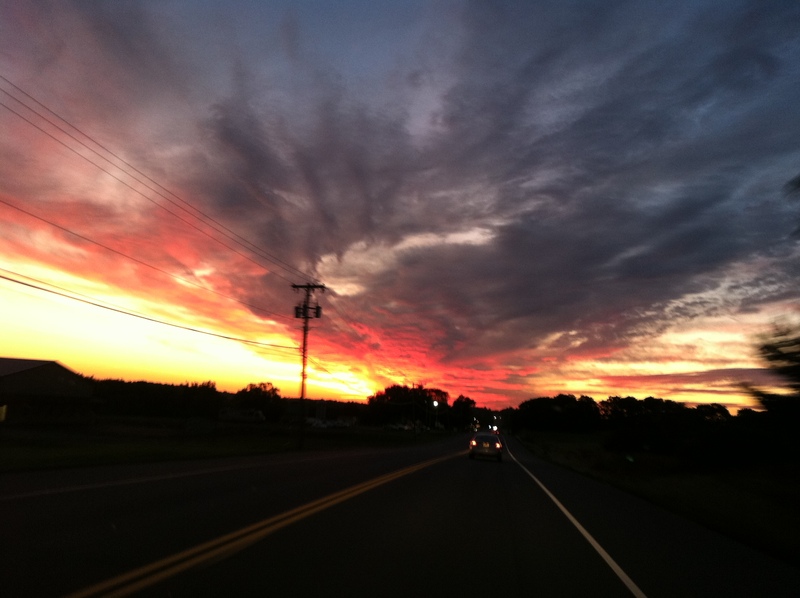 As we were driving towards Bristol mountain, I was suddenly wide awake. All it took was one look at the sky. I watched the most beautiful sunrise! The sky was completely orange. It was just spectacular! I was so happy to be there at that moment. I completely forgot that it was 6:00 am and that I was about to ride 100 miles. The ride was great! 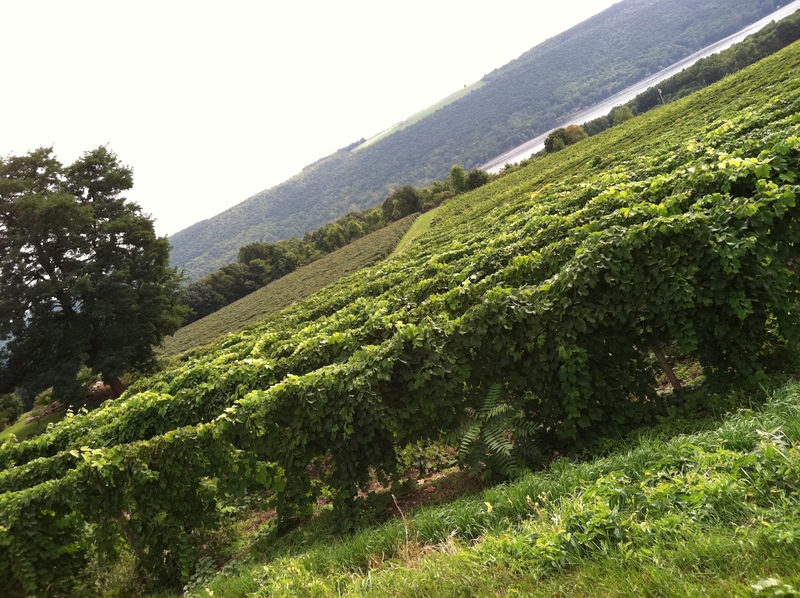 The route was fairly similar to last year’s route, so I was looking forward to riding on my favorite roads (Neil’s Creek Road and the downhill on Italy Hill Road into Branchport). Also, I had a great group to ride with and the weather was beautiful, which made it even more enjoyable. In the end, I was very happy with the ride. 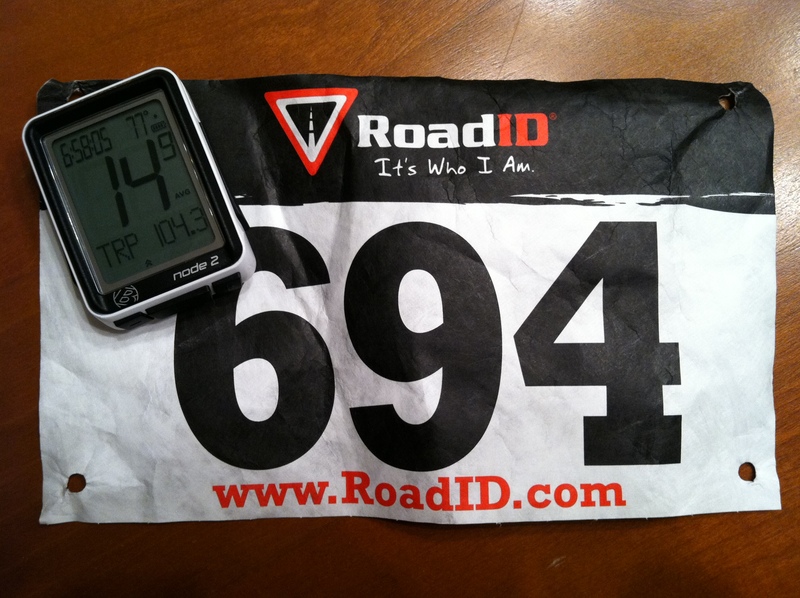 The stats were the following: 104.3 miles, 14.9 mph average speed, 6197 feet of climbing, and 6:58:05 ride time. Jane and I at the rest stop in Prattsburgh. I did have a couple of hiccups during the ride. I started to feel tired around mile 75. Serves me right for not riding longer rides during the season! My longest ride prior to this century was 55 miles. I usually try to ride at least one ride that is around 75 miles. I planned one, but unfortunately it rained that day. In addition, my right knee started to hurt around mile 85. I think that it was also due to not riding long rides. The pain lasted for the remainder of the ride. I was worried about climbing up RT 12, but I paced myself, so it ended up being fine. 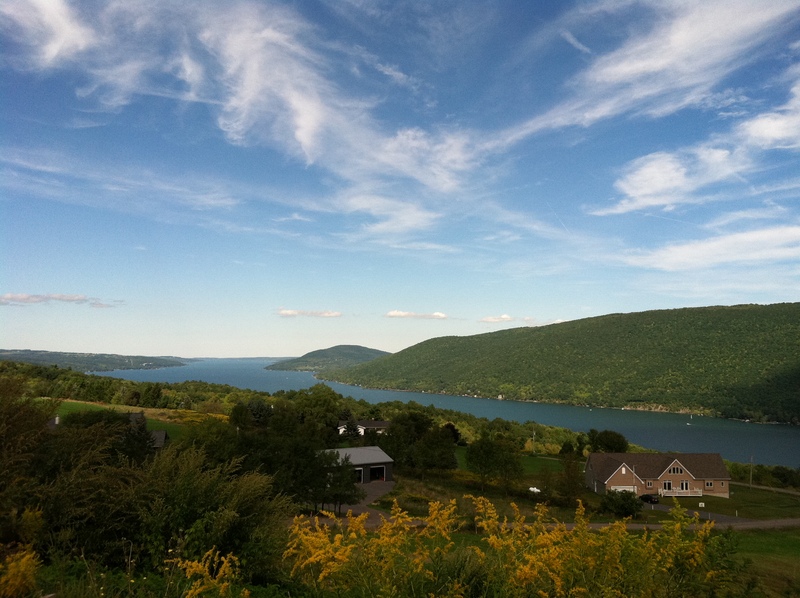 The scenic overviews of Canandaigua Lake were a bonus and it made it more pleasant. Lastly, the downhill ride on RT 53 into Naples was horrid! The road was grooved in preparation of paving, so we had to ride on it. My brain felt as if it was in a blender and my hands were hurting since I was squeezing my brakes super hard. Also, this whole scenario did not help my knee. One thing that I noticed for this particular ride was how hungry I felt after the ride. I ate a fair amount while riding. I ate 3 small peanut butter and jelly sandwiches, 1 ½ bananas, 3 slices of watermelon, and a bunch of pretzel sticks. I also drank about 6 or 7 bottles of Gatorade and a bunch of water. The event also included a post ride dinner, so I ate a large plate of pasta, salad, and a roll. I thought for sure that it did the trick. But once 7:00 pm came, I was hungry again. I ate 3 pieces of pizza (they were home made and smaller than your typical slice), a fairly large bowl of pasta, and a chocolate Tofutti Cutie. I was still hungry but I had to restrain myself from eating more. :) I was also pretty hungry the next morning. I ate 1 bagel with peanut butter and honey and another bagel with nothing on it. My hunger was finally tamed. :) Apparently I worked pretty hard during the ride. I look forward to next year’s ride! Yes… I am positive that I am going to sign up for it again. I have had some amazing rides lately. For the past 4 weeks, I have been beating my usual average speed and have been able to average as fast as 17.9 mph. So great!! But all good things must come to an end, apparently. On Saturday, I had the worst ride ever!! During the ride on Saturday, I was super hot, super sweaty, and super dehydrated. My legs started to cramp… one leg at a time, starting from the shin and up my leg to my thigh, and again cycling through my legs. It was the worst feeling! I was trying very hard not to push the pedal down, because I could feel my leg cramping. But even as I was pulling the pedal up, the back of my leg was cramping. After a few cycles, tears started to roll down my cheeks. It was very painful. I have not experienced this much pain in about 4 years. I was a novice rider then. I did not know much about nutrition and hydration. Plus, since I was a beginner, I always pushed myself in order to keep up with my friends. Not a good idea! I remember this one particular ride where the same scenario occurred… cramping cycling back and forth up and down my legs. It was so painful, that I was in tears then too. The unfortunate part was that I was pretty far from the ride start, so I had to keep going. 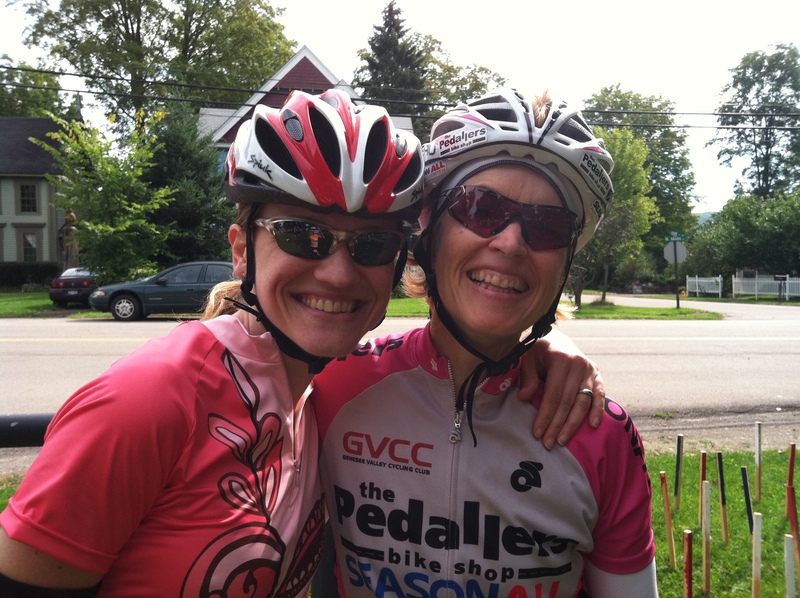 I greatly welcomed the rest stop on Saturday’s ride, which was at a gas station in the village of Bloomfield. I really needed some water and food. As we were hanging out, my friend Sara mentioned that she wanted to check out the bakery across the street from the gas station. As we entered the bakery, both of us looked at each other in awe. We found the most gigantic cookies that we both have ever seen. We have also found the largest scones that we both have ever seen. 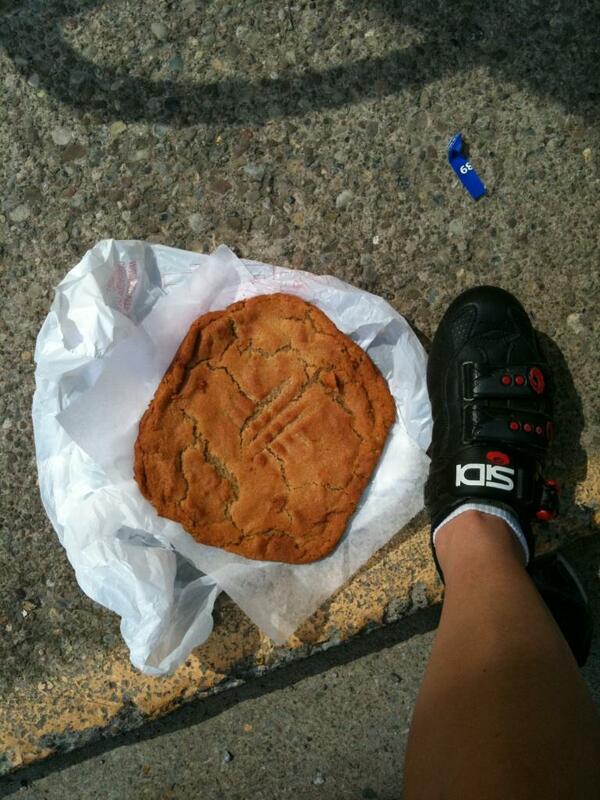 After a mere $3.50, we walked away with a gigantic peanut butter cookie and large blueberry scone. I was sure that these would help my legs feel better. My legs felt fine for about 5 miles and the cramping started once again. The damage was already done. As I stopped to relieve my cramps, I was thinking about what I did the day before. I rode about 21 miles in an also hot day and for dinner I ate some broiled fish with French fries and drank a pint of beer. Not a very good way to prepare for a ride. I should have known better.